Introduction EMSL Analytical, Inc. offers PCR and traditional culturing methods to quickly and accurately identify the pathogen that causes Legionnaires' disease. Researchers have made a connection to areas in Connecticut that have been experiencing a higher occurrence of Legionnaires’ disease dating back to 1999 to the proximity of these locations to certain rivers and watersheds. The study, published in The Journal of Infectious Diseases, found an increased number of sporadic Legionnaires’ disease cases were related to elevated rainfall and greater stream flow. Researchers concluded that their findings confirmed a possible link between weather conditions and the incidence of Legionnaires’ disease. Legionella is commonly found in a variety of natural and building water sources. Exposure occurs when it is aerosolized and then inhaled or aspirated by susceptible individuals. Symptoms of Legionellosis vary, including fever, chills, and coughing for Pontiac Fever to a very serious form of pneumonia with long term health effects for Legionnaires’ disease. EMSL also performs quantitative Polymerase Chain Reaction (qPCR) testing for Legionella at their corporate headquarters in Cinnaminson, New Jersey. They are the only commercial testing laboratory in the country that offers qPCR testing for L. pneumophila, L. pneumophila serotype 1 and Legionella spp. in one convenient test. They can also perform Whole Genome Sequencing (WGS) for outbreak source investigations involving all species and serotypes of Legionella. To view a complete list of EMSL’s Legionella laboratory locations, accreditations and capabilities, please visit www.legionellatesting.com. For service questions, please contact Christopher Goulah, Ph.D., for expert information at 716-651-0030 extension 1407. 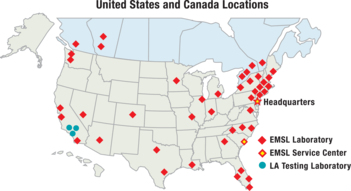 To view a complete list of laboratory locations within EMSL’s network along with accreditations and capabilities, please visit www.EMSL.com or www.LATesting.com. To learn more, please email info@LATesting.com or call (800) 755-1794.